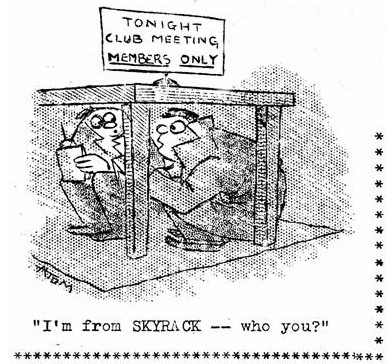 This is SKYRACK No. 19, dated 28th May l960, and published by Ron Bennett, 7 Southway, Arthurs Ave., Harrogate, Yorkshire, England. 6d. per copy, 2/6d for 6 issues. Subscriptions in USA @ 35 cents for 6 issues (6 issues airmailed for 65cents) to Bob Pavlat, 6001 43rd Ave, Hyattsville, Maryland. News of interest to SF fans welcomed. Cartoon by Arthur Thomson. NO HEADLINE NEWS THIS ISSUE, but bits and pieces, short items and lengthy chatter from all over the place. No fewer than 9 fanzines are reviewed this issue, bursting the theory-bubble that after conventions fans join the winter flies. And not one crudzine among the lot! THE TRANS ATLANTIC FAN FUND. It’s the usual and done thing for a TAFF Administrator to appeal for Funds and hardly an issue of SKYRACK has been published without my mentioning here to send votes and cash. However, the time has come to Get Down To Business! At the LonCon I let it be known, following the highly successful TAFF Auction, that the Fund was successful and that the delegate’s ticket was virtually assured. This was some £50 from the truth for whilst I started the Fund with cash in hand, the American Treasury was cleaned out last December. Cash is therefore URGENTLY needed. Also whilst the number of votes I alone have received runs into the forties, more will not go amiss. This is an extremely close campaign (the lead actually changed last week!) and your vote will count now as never before. Voting forms enclosed with this SKYRACK are therefore more than a reminder -- it’s practically a matter of arm-twisting! Votes and cash either to me, or to Bob Madle at his new address: 4500 Aspen Hill Road, Rockville, Maryland, USA. It is hoped that the next issue of SKYRACK will carry the good news that the Fund has been successful, along with the name of the chosen delegate. Congratulations to Mike and Marjorie Wallace, married 2nd April. New address is 232 Narborough Rd., Leicester. LES SPINGE 2 (Ken. Cheslin, 18 New Farm Road, Stourbridge,Worcs; 52pp 1/- ). There is still much to criticise about this second offering from the Stourbridge gang, especially the lack of qaulity artwork, but the enthusiasm and fannish good will is so pronounced as to be practically tangible and this more than outweighs the faults. This is a meaty, interesting fanzine with Archie Mercer reporting on the Lincoln Interplanetary Society, Dorothy Hartwell writing fiction, John Berry reviewing a TV programme, Alan Rispin discussing a fannish type mundane, Rog Phillips writes on the hunger of the soul and readers write letters. If all this were not enough the Stourbridge boys themselves are in evidence with reports of club activities, including the visit to the London Symposium and the visit to Stourbridge of Jim Linwood, which is covered two ways, with Jim’s report having the slight edge. A nice, friendly issue. NORTHLIGHT 9 (Alan Burns; Goldspink House, Goldspink Lane Newcastle 2 34pp). Alan Rispin seems to be spreading himself around and pops up here with a short piece on his initial attitude towards fandom. Alan Burns continues his Jugoslavian report. Klaus Eylmann reports on the latest Gerfan feuds. Alan Dodd reviews another SF film. Mike Deckinger writes fiction. And there are letters and fnz reviews. In addition Laurence Sandfield contributes the final instalment of his Fan In The Corner column, a pity, for if these columns were at times somewhat deplored by some fans, they were never uninteresting. A better than usual Northlight. BSFA Newsletter (May 1960. Editor James Groves. 6pp) which represents a between-Vectors report on BSFA activities. The idea in itself is nothing short of excellent, tending to bind the interests of BSFA members, and if future issues of the Newsletter are written and presented in this manner then the BSFA can look forward to a future far rosier than its past. DREAM QUEST (Spring l960, Peter Mansfield, 14 Whiteford Road, Slough, Bucks;30 fcsp pp). This is a new fanzine, which like the American AMRA, is devoted to the fantastic element of SF and its field of writers like Howard, Burroughs, Lovecraft, etc. The editor devotes this first issue to Burrough’s Carson Napier and he includes a glossary of Amtorian terms. A specialist appeal fanzine. LAST MINUTE FROM VINCE CLARKE.....Apologies all round. Eric Bentcliffe has stood for TAFF only once previously. Vince & APE mistaken. SPACE DIVERSIONS (No. 11. Norman Shorrock, 2 Arnot Way, Hr.Bebington, Wirral, Cheshire. 55pp.) This final issue of the Liverpool Group’s fanzine is being circulated through OMPA (I’m sitting here typing this immediately prior to the OMPA mailing-and I have 54 different copies from which to choose in this review!). Most of the issue is devoted to the America of Happy Fannish Solacon days, with part 6 of my own Colonial Excursion (at last! ), a four page report by Bill Donaho on the Solacon Motorcade and a 22 page report on the Solacon itself by Terry Carr. In addition to this titbit and its previously mentioned attendants, there is John Owen’s regular Drums Along The Mersey, and further items by Will Jenkins (The Chairman of the Philadelphia chapter of LaSFaS), Pattie Milnes, Bob Richardson, Pete Daniels (the Chairman of the Merseysippi chapter of LaSFaS) and Eric Bentcliffe. Artwork is featured from both Eddie Jones and Arthur Thomson and sputnik stamps are supplied by Liverpool Stamp Sales. As this issue bears the expected Liverpool Hallmark – Quality - it is naturally highly recommended. CACTUS 5 (Sture Sedolin, Box 403, Vallingby 4, Sweden. May 1960. 76pp. 10 issues for 7/- to Alan Dodd, 77 Stanstead Rd., Hoddesdon, Herts). This is the first anniversary issue of CACTUS and it is undoubtedly a fabulous piece of work. Included as a supplement is Lars Helander’s SFAIRA 5, two years or so out of date, but still very interesting. Pride of place in the issue goes to Archie Mercer’s LonCon report in which everyone present is at least mentioned. Bob Coulson writes on the wild friends he has in fandom. Ray Nelson’s stylus creates another Beanie Brigade. Harry Warner writes on European craftsmanship. Alan Dodd writes on a day in London ((You sure that when I spilled water on the stairs, Alan, it wasn’t a deliberate attempt to have you slip on them?)). Les Gerber reviews fanzines and Ken Cheslin writes on the evil of the dreaded Peking Tong. There are also short items from Paul Rehorst, Clayton Hamlin, Michel Boulet, George Wells and Alan Rispin, who features with other well known fans on an excellent photocover. Recommended. TRIODE 18 (July 1960. Eric Bentcliffe, 47 Alldis Street - heck, with mi 7 a rider to this SKYRACK you already know this - & Terry Jeeves 58 Sharrard Grove, Sheffield 12, Yorks). As Terry is shortly to be married and will be cutting down his fanning time, this is the last issue of one of Britain’s leading fanzines. Eric is going into partnership with Norman Shorrock to produce a new zine called BASTION. This final TRIODE is again perfect in layout and presentation, a faultless fanzine. Its 40 pages include another Harrison adventure, a short piece by Terry Carr on his wife (yes, I know all the things I could have said, but British understatement y’know), two editorials, the usual letters, a hifi piece from “Penelope Fandergaste”, illos by Eddie Jones and Atom, wonderfully registered two coloured cover and contents pages and a welcome return of Mal Ashworth's column, Abacchus. High quality stuff. Thank you, Terry and Eric, for the pleasure I’ve had in the past from TRIODE. I’m sorry that it can’t continue. There are, I understand, still available copies (l/ )of The SFCL’s Club Combozine (Ella Parker, 151 Canterbury Rd., West Kilburn, London NW6). This is not a fanzine to be misses. Therefore, why miss it? APORRHETA 17 (H.P.Sanderson, “Inchmery” 236 Queens Road, New X, London SE 14; 1/6d or 10 cents a copy, reductions on bulk! ; 52pp) With the abundance of micro-elite it is no wonder that Sandy has fallen further away from his originally planned monthly schedule. And who’s complaining? This issue boasts an extra length full-of-interest Inchmery Fan Diary (incidentally, Sandy, Eric Bentcliffe has stood for TAFF only once previously, in l955), a neat listing of theme titles by Bob Tucker (in the Tucker manner), the results and winning entries of the first Apidiascope competition, a story by George Locke, the usual columns by Dean Grennell, Joy Clarke, Cantaloupe Flabbergaste, and Penelope Fandergaste, to say nothing of short items by Belle Dietz and Don Allen. There are Rotsler illos and an Atom cover, and Les Gerber, this issue is right back on the ball - highly recommended. BECAUSE OF SPACE DIFFICULTIES and a possible change of address - I’m selling most of my collection of pro- and fanzines. Going @ l/- per are: ALPHA 5-14 ,ARCTURUS 1, BELLE LETTRE 1, BEM 2-6, BRENNSCHLUSS 1-3, BURROUGHSANIA 7,9-l3, CAMBER 2,3,9, EYE 1,4,5 and various issues of EAST AND WEST, FEZ, FHAN FOCUS, GESTALT, HYPHEN, JAZZ FAN, KIWIFAN MEUH, NORTHLIGHT, NOW AND THEN, BLUE MOON, ORION, PERIHELION PHANTASMAGORIA RETRIBUTION A BAS, CANFAN, CARAVAN, CRY, DEVILS MOTOR BOAT, DIASPAR, EXCELSIOR, FAFHRD, FANATTIC , FANDOM HARVEST, FAN HISTORY, FAN SLANTS FANTASY AMATEUR, FANTASY ROTATOR, GAMBIT/GAFIA, GEEZEE, GEMZINE, GRUE, HORIZON, INNUENDO, INSIDE JD, KTEIC, MUZZY, OBLIQUE, OOPSLA, OUTRE, PEON, PROFANITY, SHAGGY, SKYHOOK, SPACESHIP, SPECTRE, STELLAR, TACITUM, TWIG, UMBRA, VINEGAR WORM, VOID, WENDIGO, SATELLITE, SD, SPACE TIMES, TRIODE, VERITAS, VECTOR, YANDRO and probably others. Also: US hardbacks: 27th DAY (Ma ntley)7/- , WORLD OF NULL A 10/-, ALL ABOUT THE FUTURE l5/-, BEST FROM F&SF 4 7/-, SF CARNIVAL l5/-, FAR BOUNARIES l2/6. Pbs: Mad Strikes Back, Star SF Stories © 2/6 per;Who Goes There, Expedition To Earth, SF The Year’s Greatest, Shadows in the Sun, After the Rain, Winds of Time, Report on UF0, all © 2/- per.